Advanced Heat Pump Comes of Age in the New Prius Prime. Would this be a good option for Model 3 or the Bolt EV?? What’s the most often heard comment about heat pumps: “They don’t work when it’s cold.” What if there was a solution? Via Toyota Japan, Toyota says they have it. It is a “vapor injected” heat pump. What is this advanced heat pump that Toyota says they are using in the Prius Prime? How does it work and how much does it cost to implement? Tesla Model 3 Cabin – New Tech To Be Utilized In Upcoming EVs Besides The Prius Prime? The Tesla Model S does not have a heat pump but uses waste heat recovery from the drive unit and power electronics to heat its battery-in addition to an electric battery and cabin heater. Nissan Leaf uses a simple (not injected) heat pump. GM Volt and Spark EV use resistive heating. As to future models, we don’t know what Tesla will use in the Model 3 or what GM will use in Bolt EV. Tesla hinted at some new HVAC tech during the Model 3 unveiling. How does Vapor Injection work? Please note that the following technical description is not from Toyota but from one of the authors who is licensed HVAC engineer with over 35 years of experience in heating ventilation and air conditioning systems. Have you ever heard of inter-cooling? This new heat pump tech works in much the same way by cooling the refrigerant during the compression process. Inter-cooling is not new technology and has been used in industrial refrigeration systems by using two stages of compression with cooling in between the stages…..an expensive way to implement because you need a two stage compressor and an intercooler. Recent simplifications have lowered the cost however. We now can accomplish the same effect at a lower cost just by injecting a small amount of cold refrigerant vapor into the compressor during the compression process. We simply tap off a small amount of cold vapor and inject it into the compressor. A simplified schematic is shown (below) in figure 1. This new technology increases the system’s coefficient of performance (COP) and heat output resulting in warmer heating air and less expended energy to run the heat pump than a simple non injected heat pump. An increase in COP from 1.85 to 2.2 and a 20% increase in heating capacity at 0 degrees F could be expected using this new technology. Looks simple right? Well, not quite, as we need to separate some liquid particles out of the cold vapor before we inject the cold vapor into the compressor. There are two ways to separate the liquid. The lowest cost method is with liquid sub cooling which is shown in the detailed engineering schematic figure 2. Emerson has chosen this approach. A typical 2.5 ton automotive heat pump set up for vapor injection would have approximately $300 in additional parts: one new modulating expansion valve, one sub cooling heat exchanger, a solenoid valve, tubing, plus the special modifications to the compressor, plus some additional controls. Tech Better Suited Perhaps For The Upcoming Bolt EV? Stepping back, one has to ask: Why is Toyota going to all this additional complexity for a low AER plug in vehicle that has a gasoline engine? There’s plenty of waste heat available from the engine. This complex of a system would be better suited for a pure BEV in our opinion. Perhaps Toyota DOES have a secret BEV project waiting in the wings and the Mirai is just a ruse! Given that this system would be better suited for a pure BEV, do you think this would be a worthwhile option for the Tesla model 3 or Bolt EV? — or does Tesla have a better way by simply using waste heat to warm things up? Keith Ritter is a mechanical engineer, and licensed professional engineer with over 35 years of experience in heating ventilation and air conditioning systems. 49 Comments on "Advanced Heat Pump Comes of Age in the New Prius Prime. Would this be a good option for Model 3 or the Bolt EV??" Tesla won’t use a heat pump, because it most certainly means loosing the frunk, a distinctive and highly sought feature. If Elon can get people that can land a 12-story rocket on a tiny drone ship in the middle of the ocean AFTER it’s delivered payload to orbit, he can get some who can figure out how to efficiently heat a car in the winter. If they put a proper trunk in the car, he would not need the ridiculous frunk …. but yes, let’s rather have a frunk and 100’s of rocket ship engineers to invent a heating device which consumes very low amount of energy. Sounds like a great plan. Like the model X rear doors …. The S and X trunks are no different than any other available trunks. The frunks exist because the design choice was to make the EV look “normal”, even though there is no engine to fill that space. So, it’s extra storage. The mainstream market, including me, is not ready for a jelly bean (I really don’t like the looks of the i-MiEV). Funnily enough, its hard in Poland to find person who knew Model S, but it’s easy to find (younger) girls who know Model X…. by its door. I dig the frunk. Not only is it valuable as extra storage space when that’s needed, but it’s the perfect place for everyday use. I don’t haul around luggage or other big items very often, but I shop groceries three or more times a week. It’s great to put them in a room where they don’t fly about as freely. There is little correlation between frunk space and heat pump space requirements. From a space standpoint, Tesla could easily fit Model S with a “conventional” heat pump with no impact on frunk space. The Model S already has an AC compressor and the related coils and valves. A conventional heat pump system is the same size as an AC system with largely the same components. For this advanced heat pump, the only additional component taking up substantive space is the sub-cooling heat exchanger. One additional component might reduce frunk space some, but not kill it. Agree. Standard Heat Pump is almost no extra space. Just a valve to reverse the refrigerant flow. You get 3-4 heat out as the energy put in. Question to Elon Musk: how about using extra battery pack, like those recently advertised as a kind of “jerry can” for electric cars. Of course some extra connectors are needed somewhere in the trunk. This would help with so called range enxiety. They have a heat pump already, only it works in the other direction and is called ‘air conditoner’. To think that a heat pump for heating would take up the entire frunk is hilarious. Even though elon is great he can’t work magic. A heat pump is the best way, no doubt. Maybe a ftx heat exchanger for the air could work in addition to that. Not sure about this heat pump, but it sure seems like it has potential. If so, and really works and is a reasonable cost, it could alleviate much of not all of the complaints we northern BEV drivers have in the winter. There’s a sweet spot, where this is most useful. As electric range grows, the one-time call for cabin heating takes a smaller percentage of those range miles away. Peoaple don’t care. So, I wouldn’t agree a long-range BEV is where it makes the most sense, over one with shorter range or even a PHEV. Much like GM appears to pursue more of a PHEV/EREV strategy, Toyota may try the same. It’s a ticket out of DCFC sponsorship. The frustration that already shows in focus groups, is the impact on the winter range of smaller batteries. Though I never found out the marques behind it, I was in such a focus group two years ago. With my 24 KWh Leaf it’s somewhat of a concern. With a 60 KWh Bolt or Model 3 I don’t care. I care. With northern winter range loses in the 40 to 50%, this impacts long distance trips. But for local commuting and errands it’s not as much of a factor. However, wouldn’t it be nice if a 200 mile range car always was close to that capability regardless of the outside temp. I live in coastal BC and our Leaf heat pump in very (very) quick at heating the cabin and *may* impose 5% loss/ hour of operation. Heating is not a one-time call. It is needed continuously to keep the cabin warm, although heating power is less than initial heating burst. Moreover, long range BEV is often used for shorter distances with breaks in between. You may need that heating burst several times before next opportunity to charge. Think about going for business visits to several customer locations within a working day. Each visit maybe 1-2 hours, which is enough to make the car freezing cold. It makes sense, but what about long wait in traffic jam? Or being stuck in a snowstorm? I do think any affordable tech that improves efficiency is worth of using. That system would double the range of my Leaf MY 12 in winter, although even the MY13 and more recent do improve a lot with their normal heat pump. I hope it works for Toyota. Otherwise that 22 mile range on the Prius Prime will be like 12 miles in the winter. Maybe more like 10 on the highway. And slow. That’s the biggest problem with the “prime”. That transaxle is heavy, complex, and has a lot of mass that does not like to change speed. I’m positive they are working on one. I think they have seen the writing on the wall. The thing is, they may be a year or two away from being able to produce it. In the meantime, they might as well pretend they don’t believe in EVs and try to sell you a hybrid. It doesn’t really help their business to promote a vehicle they don’t have yet. You’re assuming mgmt isn’t influenced by the Japanese oil industry, where fracking methane is on their agenda, and they need methane customers. If the oil industry is willing to $influence$ Toyota, you’re never going to see an EV. Yeah, the massive Japanese oil industry that is overwhelming the world with cheap oil and LNG, driving both US shale and the Sauds out of business. Japan is importing oil/NG like crazy, especially with the nuke plant shutdowns. If you know anything about WWII, you’d know that a big factor motivating Japan was to secure petroleum resources in areas like Indonesia, as Japan was essentially oil-less. Both Heat Pump and additional heating elements have a place. While heat pumps can no go down to 5 degrees fahrenheit (2 Celsius), On those really cold days (-10 below) Having extra heating elements helps. While heat pumps work,at extreme temperatures they are running all the time and not the most silent. 5 fahrenheit is -15 Celcius. In principle there is no lower limit to where a heat pump can be used. Their COP gradually declines as the temperature drops, but a good heat pump can still have a COP > 1.5 at -20 C.
An efficient heat pump helps efficiency and in particular a gas injection heat pump is helping at a time when range is reduced due to other factors as well. Reducing the kW is a big deal, especially in low-speed driving. If a heat pump can save 1kW, then that’d be 3 miles for every hour of driving. An especially big difference in low-speed urban driving. Why do it in a PHEV? Toyota is focusing on making it efficient, and allowing it to run without the engine. Really happy to see this. I’m curious to know how much it costs _Toyota_ for such a heat pump. Note that it’s a big deal to maintain range: do that and you don’t need as much battery and it could make the difference between running the engine and not running the engine. Every cold start avoided is a very good thing. How funny. Toyota used to be famous as an eco-friendly innovator. Now, they are just a blip on the heat pump design page. “Wow, look at our cool heat pump”. Well huge Emerson has now purchased Vilter, the long time well respected refrigeration recipricating and screw chiller manufacturer who has done much pioneering work with this ‘simplified’ intercooling method. If the system is reliable and doesn’t add too much complication, why not? The new Prius will certainly be a good test of the cost-effectiveness of this system and its reliability, but then Emerson through their Vilter acquisition no doubt has many hours of real world experience here (with their screw compressors) – so its not a super big surprise that Toyota would try the system out in a heat pump for a car. Again, if it ultimately is not too much money, and the effect is good, why not? If it ultimately proves too little benefit for too much money and complication, they can always ask Mitsubishi to put one of their hyper-heat pumps in their cars. Now those things really do work in the cold. So why are we not using heat pump exchanging heat with the motor and power electronics coolant loop. That way you have pretty good chances that it’s above zero. I’ve pondered this before since the motor cooling loop on my Miev is about 10C, even in the winter. That would be plenty to heat the cabin. But the problem is that loop is no longer needed in the summer. So, it is lot of tubing only used half of the year. But I agree that EV motor and controllers works better when they are cold. 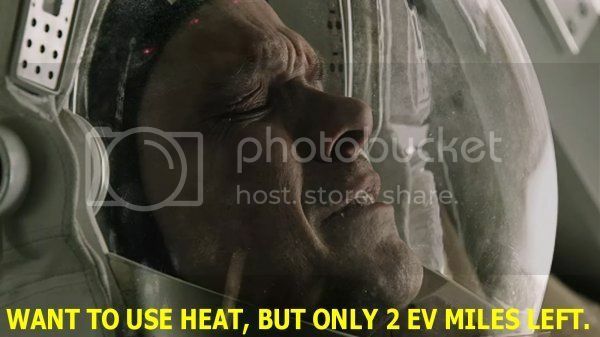 So, the heat generated from driving (it will generate) should be used for heat pump boost. My guess is that there is an upcoming EV CARB credit or similar benefit where being able to drive electric-only year-round gives better bonus (or some bonus when only part time electric gets nothing). Similar to how PiP was sized exactly to meet CA minimum HOV sticker requirements, not a bit more. Toyota hasn’t exactly shown interest in leading the EV world these last few years. Toyota was working on a heat pump for the first PiP, but dropped it. This is just the work coming to fruition. Let’s just be happy that it means higher efficiency, more electric miles and more trips without the engine running. And let’s hope that we see something like it I the Volt soon. The vapor cooling is a bit the last resort of an old system. Here presented in the qdrive refrigeration use but which can be converted to a heat pump. Either system is getting rid of nasty cooling gases. The KIA SOUL EV has the most efficient heat pump of any car. It would be good to have an outside testing group compare the heat pumps and show the results. I bet it just a few % at most. Now an old compressor air cond is 3 to 4 times more wasteful so that shows why Heat Pumps are so common on efficient vehicles. Use a heat pump or use waste heat? Why is this an either/or? Model S uses (blows with fans?) waste heat and electrical (resistive) heating elements. So it seems to me the smarter change, if any, would be to replace the resistive elements with pumped heat, not to stop using waste heat. Though for all I know it may be that a heat pump is more efficient than moving (fans? radiators??) waste heat, in which case having only pumps might be preferable. Renault has it for years in the ZOE. It helps in winter and summer to extend range. Why don’t Gm reuse the heater designed and produced for the elctric Chevy S-10? I have the Owner Manual, and it described a Diesel fueled heater that is located near the power steering in the front bay (or motor bay since there is no “engine”).